I received this box of love from Natta Cosme way back in December, before Christmas. Inside was an item for review, a Christmas card and two handmade hairclips that are simply gorgeous! I truly appreciate the effort by the Natta Cosme team and of course, I'd like to share with you about the skincare product that I got! Tadaa! It's the SKIN&LAB Dr. Pore Tightening Glacial Clay Facial Mask which claims to be "the ultimate pore mask" from Korea. It is proven to solve excess sebum secretion as well as minimise enlarged pores and firms sagging skin. Glacial Clay Facial Mask contains glacial clay, which removes impurities deep within the skin and oatmeal, which eliminates unevenness, and moisturises the skin. These two ingredients combined can not only treat acne skin but provides balanced hydration as well. The results are said to be almost instantaneous and not only does it act as a "cover up" product that doesn't clog the pores, it does not contain silicone which makes it the perfect everyday mask to give your clearer and firmer skin in the long run. The clay mask is a greenish-grey colour and may look slightly um, off-putting, but thats's where all the goodness are at! You can see there is a little oil on the surface which means that it won't dry out the skin and is suitable for people with sensitive skin like me. The main ingredients are 3000mg of Canadian Glacial Clay (for sebum control, clears acne, skin waste removal, calming), oatmeal (for exfoliating, skin softening, deep hydration), tea tree leaf (for acne prevention and acne resolving), Portulaca Oleracea extract (for hydration and acts as an antioxidant), Allantoin (for sensitivity reduction, controls dead skin cells) and last but not least, Kaolin & Bentonite (for waste removal, pore contraction). SKIN&LAB's special 3Cs Pore Care System comes into place to Clear, Contract and Care for the skin. With all these powerful acne-fighting and pore-clearing ingredients, your dream of having baby smooth poreless skin is not far off! Step 1: CLEAR - Preparation phase, deep pore-cleasing helps to eliminate dead skin cells, excess sebum and other skin debris. 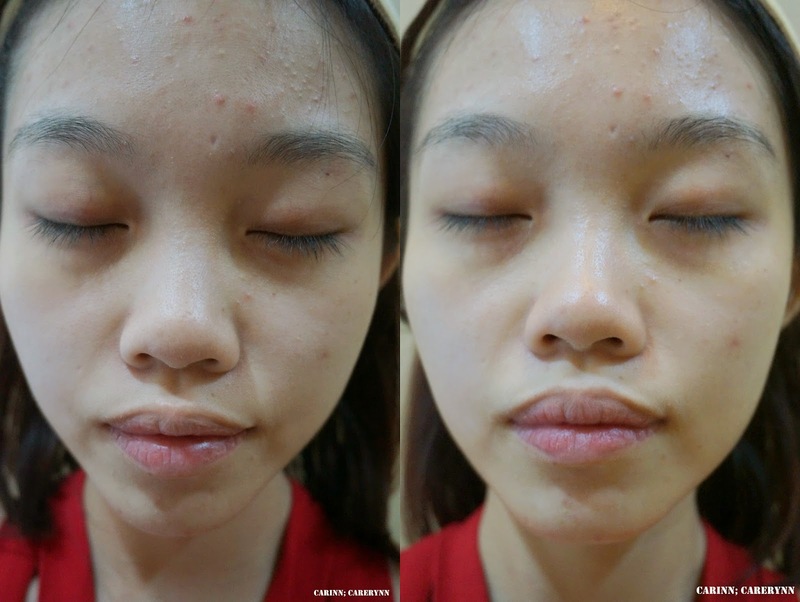 Step 2: CONTRACT - Recovery phase, pore-tightening caused by open pores contracting and pore walls firm up and returns to its normal healthy structure. Step 3: CARE - Rejuvenation phase, skin is nourished and protected as anti-bacterial activators are delivered into the skin to hydrate and provide an effortlessly flawless look. I especially liked that a spatula was provided for better hygiene and convenient use! The texture of the mask is soft and spreads easily due to the high moisture level. This glacial clay and fine oatmeal mask allows you to enjoy 2-in-1 masks in just one step. How cool is that? Do not that you shouldn't leave the lid open after use as it is a clay mask after all and will dry up easily. Step 1: After toning your face, apply appropriate amount of the mask on your face. Do avoid contact with eye area. I really prefer to use the spatula than my hands as it spreads more evenly! The consistency of the mask is amazingly smooth. Not sure if you can see it but the masks has completely dried up after 15 minutes and feels tighter. The mask feels cooling and smells kind of herbal-ish. Some sharp pain is felt initially but don't worry as it's just the mask activating its pore cleasing effects. The pain should subside gradually. - Use the mask on targeted areas such as sudden break outs or oily T-zone. The mask is especially useful for reducing newly formed acne spots. - The mask can also be used on acne-prone areas on the body, such as neck and chest. It is best to use after a warm shower as the pores are open then. - To experience better contraction and calming results, keep the mask cool in the fridge. After rinsing off the mask, it's time to lock in the moisture! For best resullts, use SKIN&LAB's Dr. Color Effect Red Serum for more radiance and youthful-looking skin! Natta Cosme was so sweet to provide us a sample of that. The results after just one use. I love using clay mask as I feel that it deeply cleanses my pores and leaves me with brighter, healthier and cleaner skin. This Glacial Clay Facial Mask does just that and the best part is, it does not dry out my dry, sensitive skin. While the minor pain is quite annoying initially, I do enjoy the soothing, minty effect after applying the mask. You can see that after exfoliation, there are less bumps on my skin, especially the forehead area. I'm going to be hardworking and use the clay mask every week to get acne-free skin! It is recommended that people with oily skin use this 2 - 3 times a week while people with dry and senstive skin should keep it to a maximum of 1 - 2 times a week. The mask has also cleared up my blackheads and whiteheads which were initially quite prominent, especially on my nose and chin area. The redness of my pimples has also been reduced. Because oatmeal is so gentle, it does not cause a stinging sensation when you're washing off the mask. Now my skin feels more hydrated and fresh! The results are immediate and obvious, it's a quick solution for anyone prepping the skin for an important event. Another thing that I realised is that my makeup goes on and stays on better each time after I use the mask. If you're interested to try out this miraculous mask for yourself, you can find it HERE for only RM71. I've tried other clay and mud masks before, and I honestly think this is one of the most reasonably priced ones. One tub is 100ml and can last you for a long, long time. The mask expires in one year. Thank you, SKIN&LAB for helping me get one step closer to poreless, acne-free skin! You're definitely a keeper! For more SKIN&LAB products and other brands, find them from Natta Cosme! hey Carinn!! I guess it is my first time I comment to you :) anyway, as you said your skin is sensitive right? my skin is sensitive and yet can say dry.. anyway, do you think it is suitable? you got itchiness or not?? Hi babe! Thank you for commenting! Heh. I think the mask is pretty suitable for sensitive skin but it's best not to leave it on for too long and don't use it too often as it will dry up the skin even more. There's no itchiness but it's painful at first. However, the pain will subside so don't worry about it. Use a hydrating mask or serum after that to soothe your skin! :) Hope this helps!